“Because of Sundance Marketing, our brand has a powerful, strategic advantage over competitors in multiple markets." Emergency Rooms at hospitals nationwide are overburdened by patients with non-life threatening issues who don’t actually need ER services. At the same time, doctors’ offices have not increased their hours enough to fulfill this need, especially during evenings and weekends. Therefore, there is a huge, unmet need that has given rise to the urgent care business. The Exigence Group, experienced in managing ERs in Western New York, recognized an opportunity. Their answer was Western New York Immediate Care with extended hours to access board-certified doctors in state-of-the-art facilities.. The next step was to get the message out about this fast, efficient, alternative to emergency care. 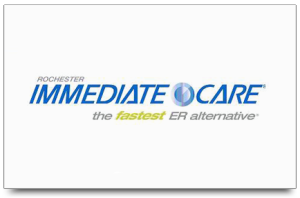 When we started working with the Exigence Group to promote their urgent care business, Western New York Immediate Care and the soon to be open Rochester Immediate Care, the objective was to promote awareness of the facilities and encourage patient use. We introduced TV with the opening of their 1st Rochester location in Greece. While we were growing, so was the competition. In less than a year, the objectives began to shift. No longer were we convincing consumers about the convenience and efficiency of urgent care. We needed to position our urgent care centers as the premiere Immediate Care facilities. When you need help quickly, there is no time to do research! We used television for its comedic strengths and radio for our more serious, heart-felt community messages and to keep Immediate Care top of mind during the holidays which see peak usage. Our message,” Life Happens we Fix it Fast”, drove the campaign during this phase. After much success in the first year, The Exigence Group was operating in an environment in each regions where the benefits of Urgent Care over doctors’ offices and emergency rooms had been established. Marketing efforts became focused on further differentiating our Immediate Care centers from the competition. We called out the unique services and staff we offered and assumed our position as the gold standard in Urgent Care quality, as awarded by the Joint Commission. We used TV, Radio, Digital and PR to bring to life the everyday need for Western New York Immediate Care and Rochester Immediate Care in a way that all 25-54 year old women could understand. And would leave big smiles on their faces. Moms and wives could see themselves and their lives in this work, laugh, but most importantly they could imagine their families getting needed care on their own schedule. We mixed it up by using a combination of monthly flighted TV schedules for brand awareness and strength. Radio spots ran during specific holidays and key “busy” times. We used broadcast to promote new location openings. In addition, a heavy dose of PR kept the client in the news on television and in print publications. All the work simultaneously celebrated the health care decision maker, highlights the real value of Urgent Care over Emergency Room care and establishes WNY Immediate Care as the benchmark in the category. Because of its steady patient growth and profitability in managing urgent care centers, Team Health, one of the nation’s largest providers of hospital based clinical outsourcing in multiple departments, purchased the Exigence Group, primarily for their assistance in helping them grow their urgent care business. The core Exigence of Team Health now operates locations in Buffalo and Rochester NY, Naples and Ave Maria Florida, Columbus Georgia and Austin Texas. The Exigence Group, experienced in managing ERs in Western New York, recognized an opportunity to improve access to board-certified doctors. Sundance Marketing launched a multimedia, TV, radio, digital and Public Relations campaign to first position Western New York Immediate Care and Rochester Immediate Care to be the faster alternative for urgent care, and then to position them as the standard setters of quality in the growing urgent care marketplace. In the first year of promotion across Western, New York, Exigence opened two (one in the Buffalo area & one new Rochester facility) to support a growing demand of as much as 35%.